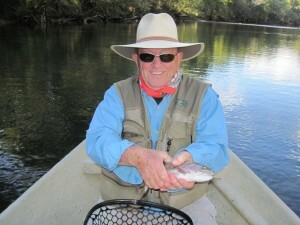 Glenda lives just south of Houston, Texas, and is a regular client of ours with a real passion for fly fishing. On this trip she brought along her husband, Russ, who is a retired NASA engineer and a very interesting gentleman who would really rather be playing golf than fly fishing. Bottom line is that these are really good people. Anyway, on to the fly fishing. Yesterday was an absolutely gorgeous fall day in Arkansas! 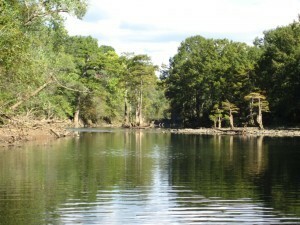 The river was gin clear and near dead low, so we decided to do a drift boat trip down Mystery River. Glenda is probably the first client in our boat to fish the very same fly, a #16 PBS, all day long! With bright sunshine and low, clear water the fly fishing was challenging; but Glenda and Russ caught lots of fat Rainbows with Russ taking fish on a #16 Hairy Legged Sowbug and #18 Zebra Midge. 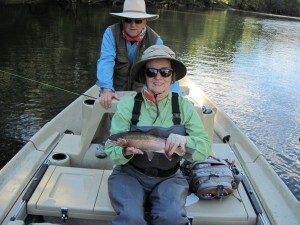 Russ and Glenda hooked up at the same time on the two best fish of the day; Russ with a 16″ Rainbow and Glenda with a 22″ big boy. It was a challenge for Bo to net both fish and get photos; but it was a fun time.